As I mentioned last week, I could not identify one of the vegetables included in my last farm share delivery. The vegetable looked like a purple turnip/cabbage with leaves attached to green stalks. Good thing the farm included a vegetable key – we had received kohlrabi! Kohlrabi (pronounced “coal RAH bee”) comes from the German words kohl, meaning cabbage, and rabi, meaning turnip. Its name is a perfect description of this vegetable. Even though the variety we received had a dark purple skin, it peels off easily to reveal a light yellow flesh. After sampling the roasted kohlrabi, SensitiveHusband and I agreed that it tastes like a turnip without any bitterness. This means that you can cook the vegetable with a variety of seasonings and they will flavor the mild kohlrabi very nicely. *Kohlrabi is rich in vitamins such as potassium and manganese, and dietary fiber, but has only 27 calories per 100 g, virtually no fat, and zero cholesterol. *Like other members of the brassica family, kohlrabi contains health-promoting phytochemicals such as isothiocyanates, sulforaphane and indole-3-carbinol. *The vegetable contains good amounts of many B-complex vitamins such as niacin, vitamin B-6 (pyridoxine), thiamin, and pantothenic acid. *Its creamy color flesh contains small amounts of vitamin A and carotenes. Kohlrabi leaves, like turnip greens, are also abundant in carotenes, vitamin A, vitamin K, minerals, and B-complex vitamins. The commercial production of kohlrabi is relatively low in the U.S. so there are not many statistics about the production or consumption of the vegetable. Perhaps in the coming years, as more people find them in their farm share boxes, try cooking them, and finding that they are tasty, consumption will increase and so will the statistics! Try this simple recipe below and see how tasty kohlrabi can be. Cut the kohlrabi into 1/4 inch thick slices, then cut each slice in half. Combine olive oil, garlic, salt and pepper in a large bowl. 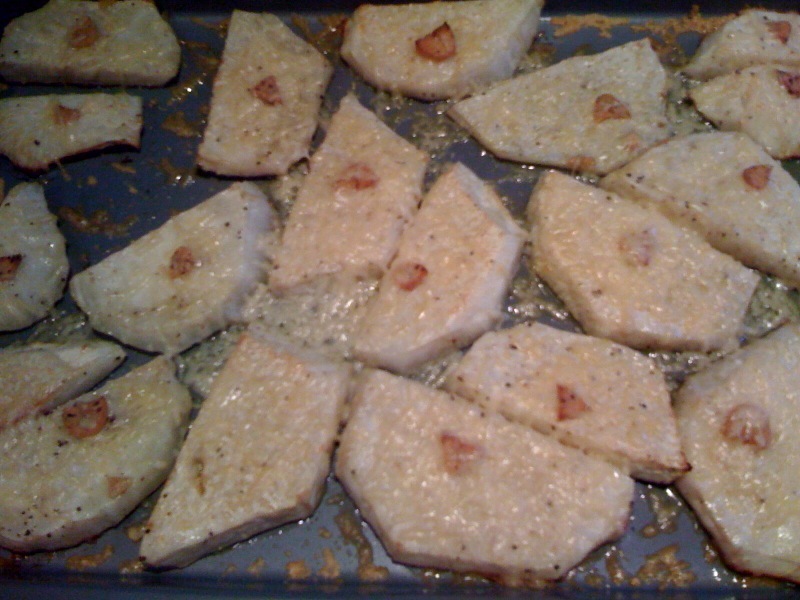 Toss kohlrabi slices in the olive oil mixture to coat. Spread kohlrabi in a single layer on a baking sheet. Bake in the preheated oven until browned, about 25 minutes. Remove from oven and sprinkle with cheese. Return to the oven to allow the cheese to brown, about 5 minutes. Serve immediately. I am sharing this recipe with Simply Sugar and Gluten Free, Food Trip Friday, Miz Helen’s Country Cottage and Gastronomical Sovereignty. This entry was posted in Recipes - Vegetables and tagged Cane sugar free, Gluten free, kohlrabi, Yeast free. Bookmark the permalink. I am co-hosting a new linky party called Fresh Foods Wednesday – i would love it if you’d come share this post (or any other CSA collections, farmer’s market hauls, garden harvests, seasonal recipes or related food rants) with us. Hope to see you there! I’ve been on a mission to get everyone in my CSA to embrace kohlrabi. When it was my turn to work the distribution last week I was talking it up and giving people recipes so they wouldn’t just dump it in the swap box. I’m with Kristy, I usually eat it raw and I have grilled it. I’ll have to try this some time though! It looks really good. Thanks for sharing with the Fresh Foods Blog Hop! Sam and Kristy, thanks for your comments. I am going to try eating kohlrabi raw, now that you both suggest it. Enjoy your day! Sounds great and very interesting! Visiting for FTF- hope you can stop by.. Your Roasted Kohlrabi looks awesome, can’t wait to give it a try. Hope you are having a fantastic week and thank you so much for sharing with Full Plate Thursday. Thanks for sharing it with us and also for joining Food TripFriday!! !